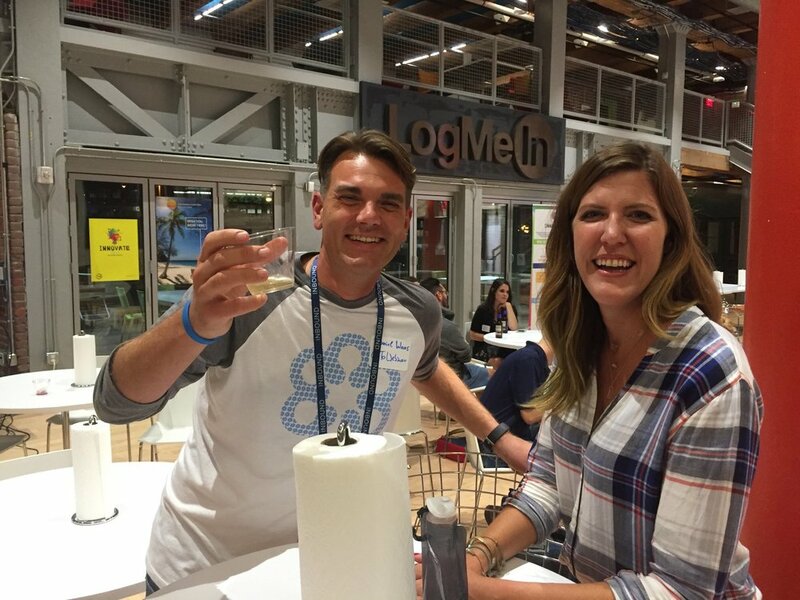 Boston Content organized a Tuesday night of learning, networking and community-building on September 26, downstairs at LogMeIn. Co-Executive Directors Katie Martell and Katelyn Holbrook welcomed a packed house of marketing professionals, reviewing some of the group’s recent achievements. Martell and Holbrook first took turns highlighting a few well-attended events over the summer, such as “Mornings Are for Marketing” at GA Boston, a pre-Content Marketing World get-together in Boston, as well as plans to revive the Boston Content awards later this year. They then introduced the three speakers for the evening. Dan Waas on the challenges of the German language. Next up was Daniel Waas, Marketing Director of GoToWebinar, who began with a humorous overview of the maddening challenges of the German language (Waas is German), asking the audience to collectively utter German words like “rechtschreibung” that were nearly unpronounceable. Waas then made a powerful business case for repurposing (or recycling) content, creating webinars that engage target audiences in new and different ways, and then transforming the webinars into repurposed content like blog posts, all at relatively low costs. In a talk entitled “The Lazy Marketer’s Guide to Content Repurposing,” the energetic and affable Waas recommended that “lazy” content producers (we’re all guilty as charged, of course) give webinars a try, serving the needs of target audiences, while they learn and improve as they go. Arestia Rosenberg on core values and not backing down. The evening’s final speaker was Arestia Rosenberg, co-founder of Boston Content, who spoke about how she moved from filmmaking to building content teams at The Daily Beast, to her current role as a freelance storyteller and strategist. Rosenberg’s message was to stick with your gut, creatively and in everything else. She recalled having a difference of opinion with a boss about hiring a new member of her content team. The boss favored an experienced professional, while Rosenberg wanted to hire a less experienced person whom she considered highly coachable. In the end, she said, she backed down and the more experienced person was hired. “This person quit after a week,” she said, “and I asked my boss how he liked his new hire now.” Rosenberg urged the audience never to back down on their core beliefs. Rosenberg then explained what she looks for in a content professional. “You have to hire people you’d like to hang out with all day, because that’s just what you’ll be doing.” This likeability factor can even outweigh a lack of experience, she told the audience: “If you’re 25 years old and don’t know anything, that’s okay, but I better like you enough to teach you what you need to know.” The ability to learn and adapt are key drivers of success, said Rosenberg. Dan Waas and Arestia Rosenberg. After Rosenberg’s talk ended, the group had an hour to network, talk with the speakers and have a drink. If you weren’t able to attend, be sure also to check out our photo gallery here.